TD Canada Trust recently announced that the Apple Financial Services program has been discontinued for individuals in Canada. Canadians with an Apple Financial Services credit card issued by TD will no longer be able to charge purchases to the account as of July 26. Through the program, any approved customer in Canada could receive three months of same-as-cash or no-interest financing on Apple Online Store purchases of $750 or more. The program was not valid for in-store purchases. Apple removed the "consumer" section of the financing page on its Canadian website about a month ago, signaling the entire program is discontinued. 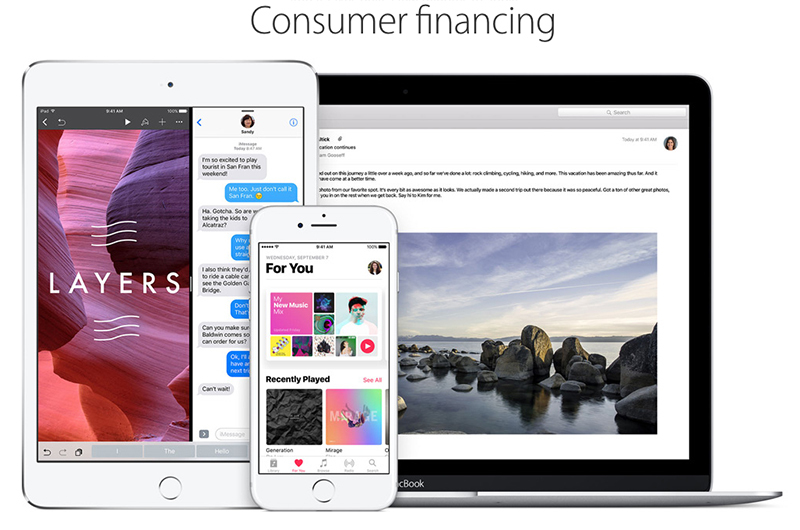 Apple continues to offer financing to businesses and educational institutions in Canada. Apple continues to offer financing to individuals in the United States through the Barclaycard Visa with Apple Rewards. I'm of the opinion that if you can afford monthly payments, and they're 0% interest... I do NOT feel this is incurring debt. Respectfully, your opinion is wrong. The interest has nothing to do with, and is not the indication of debt. The monthly payment you owe for the item is the debt. You don't own it until it's paid for in full. If you don't pay for the item in full in the agreed time frame, that debt will be collected by either repossession, lien, or both. Fine with me. I’m of the opinion that if you can’t afford a new phone or a new computer and you still have one that works, you should save up and then buy when you have the money - instead of incurring debt. Respectfully, your opinion is wrong. The interest has nothing to do with, and is not the indication of debt. The monthly payment you owe for the item is the debt. You don't own it until it's paid for in full. If you don't pay for the item in full in the agreed time frame, that debt will be collect by either repossession, lien, or both. You're right but I feel like they were responding to that other person about it being a bad thing to use your credit, which it is not. I do it all the time and I'm responsible about it. My credit score is a little over 800 and I put just about everything except mortgage and utilities on my card using auto pay each month, and I have the card set to auto pay from my checking account. I rack up a huge amount of cash back this way. I also pay cash when I get a new car, so I'm probably an outlier, but I don't think there's anything wrong with using the system to our advantage. The problem is all the morons out there and the predatory loan tactics. I'm always amazed that people can't just write up a simple spreadsheet of money going in and money going out and tune it so that money going in is higher than money going out. But people aren't willing to either make sacrifices or work harder. I even did this with my wife several years ago for the last two years of college when we were both living on her $12/hr. We had to cut back our groceries, get rid of cable, get a smaller place and go on dates every other week instead of once weekly, but we didn't hate life and didn't need government assistance. I get that's not always possible if you're living in poverty, but there are people like my dad who make twice as much as what me and my wife make combined today and yet have far less money than we do. It's obviously your opinon, but frankly not everyone can afford what they might actually need at the time of their purchase. Your opinion seems to be ignorant of the fact that people can incur debt wisely, pay their bills on time, and get the things they might need in their life for their profession and whatnot. Stick to spending habits and stay out of the economics that undergird this issue. Who would’ve guessed this posting would turn into an opportunity for some to humblebrag about their credit score and the rest to give their opinion on what others should do with their money. If the financing is without interest, neither approach is really better - the cost is the same. Financing just spreads the payments. Buying on credit is not advantageous, aside from possibly building credit, and maybe getting cash back if your credit card does that. This is more of a personal point of view, and not financial. From a financial point of view, the above statement is incorrect. If I'm wrong, tell me where I'm mistaken. The short answer is TVM ('http://www.investopedia.com/terms/t/timevalueofmoney.asp'). This basically means the value of a dollar (or your choice of currency) is worth more today than it is tomorrow. If someone was getting free/deferred financing from a purchase, they could invest the cash that they normally would have spent and made money off of it. Even if it was just a savings account, in the end the investment would have made money. Not taking advantage of deferred/free financing that is offered is essentially leaving money on the table. Three months zero percent wasnt much help anyway - unless youre waiting for an income tax cheque. Longer term, lower interest financing would be more helpful especially now that Macbook Pros are as expensive as a used car!